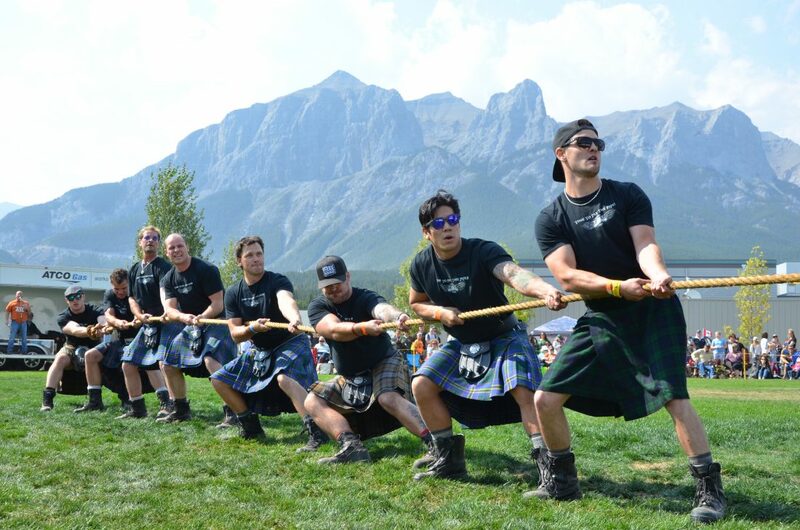 For the 28th year, the Highland Games return to Canmore, Alberta to celebrate Scottish culture. Canmore A.B. – Scottish heritage will be on full display this September Long Weekend as the Canmore Highland Games return – early bird tickets are now available. Since 1991, the celebration of the town’s Scottish heritage has become a mainstay for Canmore, creating over 25 years of pride and sense of community for the town named after King Malcolm “Canmore” III of Scotland. The first Highland Games in history were held under King Malcolm’s rule at the Brae O’Mar. The original purpose of the games was to find Scotland’s most durable subjects in order to serve as the King’s messenger. Starting at 5pm on Saturday, September 1, the Highland Games begins with the ‘Taste of the Highlands’ at the Don Garen festival tent in Centennial Park on fifth avenue, where attendees can sample over 120 local and international wines, scotches and some of the most celebrated micro-breweries. Sunday starts off with a pancake breakfast sponsored by Vabella’s Gourmet Foods in Centennial Park, before the Scottish and Canadian-Scottish team athletes compete in tug-of-war, shot-put, weight throwing, hammer throwing and Caber toss. The Games on Sunday will also include Highland dance competitions, featuring some of the most skilled Scottish dancers in the area, a sheep dog herding demonstration, and an array of Pipe bands, bringing the heart of Scotland to the centre of Canmore. Wrapping up the Highland Games is the Ceilidh, a spirited celebration of music and dance. Headlined by world famous Celtic band, The Mudmen, who have featured on tours with ZZ Top and The Guess Who. Supporting the headline act are Scottish Country Highland and Irish dancers, as well as a guest pipe band. After the threat of being cancelled in late-2016, local business Spring Creek Real Estate helped the Three Sisters’ Scottish Festival Society keep the Highland Games tradition alive and are now an ongoing major sponsor. However, there is still further sponsorship required. Spring Creek President Frank Kernick recognizes the importance of the Games to Canmore’s identity and wanted to do his part in rescuing the event. A strong community drive from the local residents and businesses of Canmore, along with the volunteer program have helped to ensure that the Highland Games lives on for another 25 years. Also named after King Malcolm is the brand-new Malcolm Hotel, which has started taking its first conference and event bookings and will be opened for bookings during the Games. Managed by Clique Hotels, The Malcolm will be Canmore’s premier luxury hotel, drawing inspiration from Scottish heritage with a modern touch. Early bird tickets are now available for the Games. Tickets can be purchase for single events or as bundled packages ranging from $5.00 to $60.00. https://canmorehighlandgames.ca/tickets/. Spring Creek is a mountain neighborhood comprised of homes for locals and vacationers of all ages, located within walking distance of downtown Canmore in the Canadian Rockies. Surrounded by mountain views, vast expanses of unspoiled wilderness and clear, glacier-fed rivers and streams, opportunities for outdoor adventure include world-class skiing, golf and fishing, hiking, biking and mountaineering.